The Biblical World: Believing God has a plan for your life might improve your mental health. Believing God has a plan for your life might improve your mental health. One of the famous evangelism lines of Campus Crusade for Christ is: God loves you and has a wonderful plan for your life. And while the four spiritual laws might help you find salvation and escape eternal punishment, who would've thought that believing in a God's plan might also improve your mental health? The third portion of the Baylor University Survey on Religion has been released with some interesting results. According the the survey, if you believe that God has a plan for your life you than you are more likely to be poor and less educated. On the other hand, you are less likely to have mental heath issues. 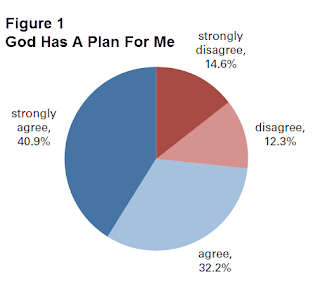 Most Americans (73.2%) believe that God has a plan for them. Those who feel strongly that God has something wonderful in store for them tend to have lower incomes and less education (p.2-5). Heaven is a more popular notion than Hell. Nearly two-thirds of American adults (62%) absolutely believe that Heaven exists, whereas barely half (51%) express the same certainty about the existence of Hell (p.26). Those who believe in a very engaged God who is involved in the world and in people’s lives fared better insofar as mental health matters included in the survey when compared to those who believe in a very judgmental God who is critical, punishing, and angered by sin (p.14-15). Respondents who strongly believe they have a warm relationship with God report 31 percent fewer mental issues, on average. Those who strongly believe God knows when they need support report 19 percent fewer mental health issues, on average. Those who strongly believe that God is responsive to them report 19 percent fewer mental health issues. Respondents who strongly believe God’s love never fails report 17 percent fewer mental health issues, on average. What do you make of these numbers? Does believing in God or a plan of God help people to find an anchor in their life? To answer your question at the end of the post, yes, I believe God has a plan for my life. But, it's a complicated idea and how I walk that out is not as simple as asking for direction and receiving it. What do you believe, John? Hope you don't mind John, but I've nicked content from here. I find this topic fascinating frankly. Let me know if this is a prob. I don't know about that...I grew up believing God had a "plan" for my life. But these days I find it more encouraging to think in terms of purpose--God has a purpose for my life. Getting hung up on "plan" language could sometimes have us searching for what the specific "plan" is, which can get discouraging. But if I go through life believing my life, created by God, has a purpose, because God created me for a purpose, I'm much more able to adapt and roll with the punches. The "plan" may change, but the purpose remains the same. For me, that purpose is to love God and those around me and be about God's good work in the world, in whatever way I can at the moment. "What do you make of these numbers?" I wouldn't be surprised if these statistics are just one instantiation of a more general truth: "Believing that X has a plan for your life improves your [own self-assessment of your] mental health". The problem is that you can fill in any belief, group, etc. for X, and it is likely to be true. I also think that the more well entrenched and widespread one's belief that X has a plan, the greater the effect it will have on one's perception of one's own mental health. By well entrenched and widespread, I mean that one thinks about X's plan for one's life in nearly all of one's activities (from getting married to driving across town). If my view is right, then you could fill in anything you'd like for X, including Santa Claus, or the USA, or the natural world. If that's so, then I guess it shouldn't be surprising that we'd _perceive_ ourselves as more mentally healthy if we have such an outlook on life, but the real question is whether we, taking the 3rd person perspective here, really want to call THAT a state of positive mental health.